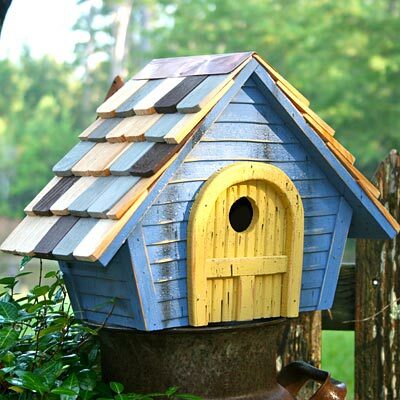 Celebrate avian pioneers by offering them a roost in the Heartwood Blue Prairie Home Bird House. The rectangular frame and low profile of this shelter evoke classic Prairie School architecture, furthered by the wooden construction. Horizontal lines throughout the soft blue face and sides of the home hint at siding, and the bright yellow, rounded faux door easily captures attention. A 1.5" diameter entry hole at the top of this door invites birds into the home, and the pitched roof protects the shelter. Multicolored shakes bring a touch of whimsy to the roof, offsetting the copper band along its ridge. A cleanout disc on the back of the abode helps you monitor the nest, and drainage slots on the base enable any water to exit. The wooden body withstands the elements, and the home can be mounted on a pole or post using a mounting bracket (not included). Offer new bird families their own vivid roost with this Blue Prairie Home Bird House. Made in the USA.